At the start of the year I had the pleasure of meeting jeweller and cigar aficionado Matt Booth of Room101. We had coffee and talked about various subjects including the (then) recent Jesus Skull pendant collaboration with artist/tattooist Chuey Quintanar. 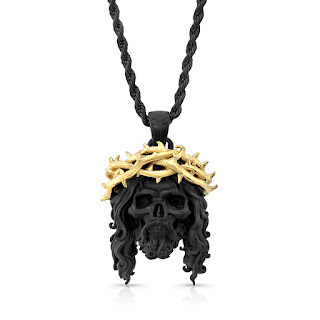 Matt divulged that another was in the works, a more 'traditional' Jesus piece that promised to look nothing like what's considered the standard as we know it. 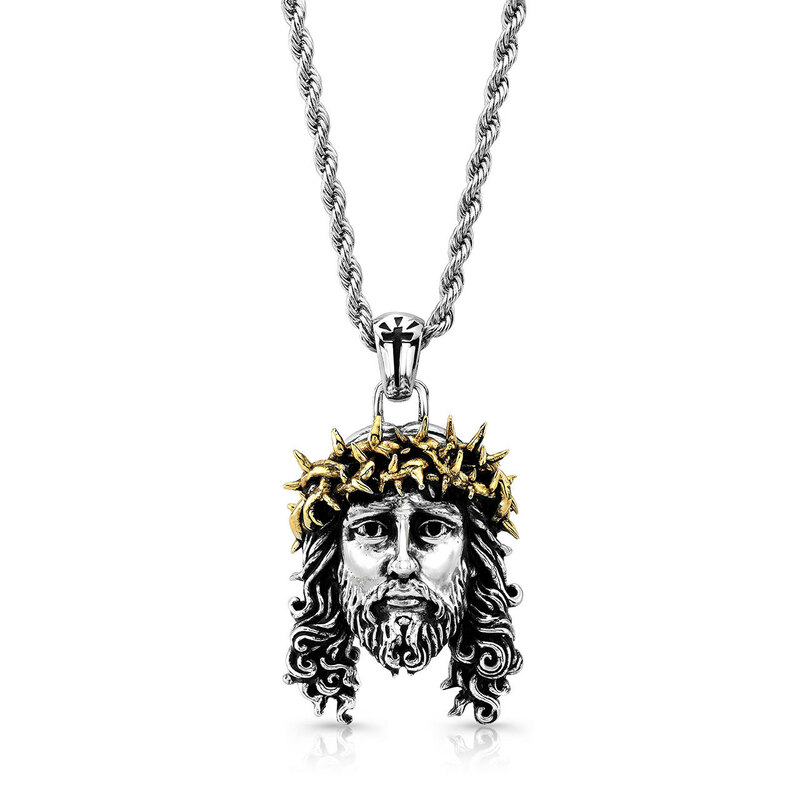 On the release of the Room101 x Chuey Quintanar Jesus Piece I reached out to Matt to find out more about the decision to change the look. "To me, the standard "Jesus Piece" is one of the most overly done and poorly done pendant designs in the world. 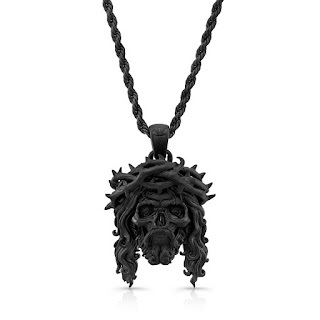 When I saw Chuey's rendition of Jesus (and the skull variation as well) I became obsessed with the idea of bringing his artwork to life in 3D as a pendant design. I wanted to build a piece that was a direct representation of Chuey's artwork, and was honored to be afforded the opportunity to do so." The Room101 x Chuey Quintanar Jesus Piece is available in two versions - Stainless steel with all over gold plate and Stainless steel with two tone gold plate crown. Both come on a 25 inch rope chain. 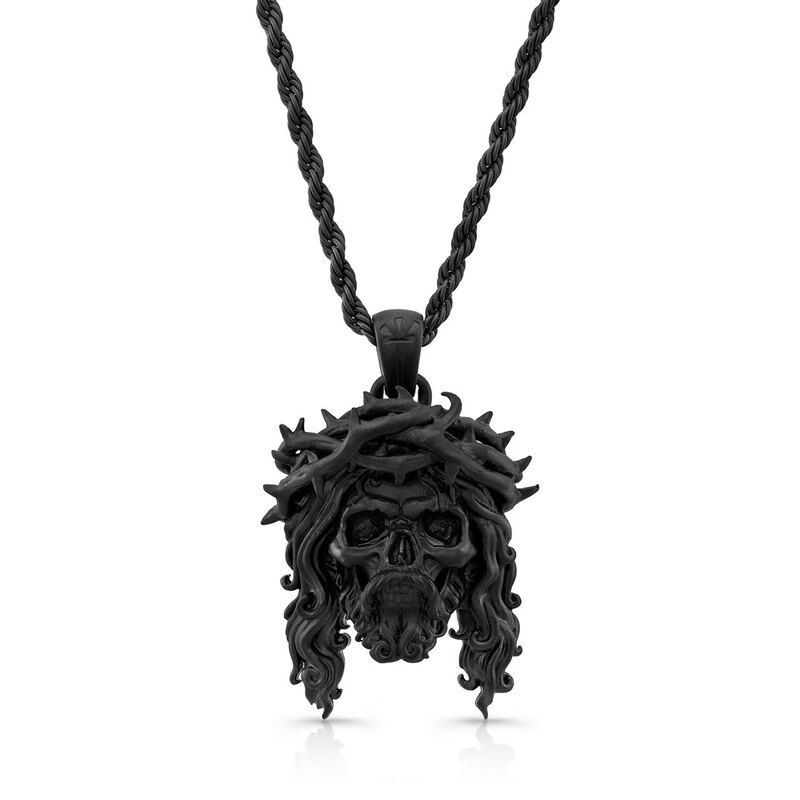 I also asked Matt about the two new limited edition matte black versions of the Jesus Skull. "This was Chuey's idea. He asked me if it was possible to do - and of course it was. Ultimately you never know just how cool (or uncool) a jewelry design can be until it is sitting in front of you completed. I was very pleased with the way this limited series turned out - it definitely makes an impact." 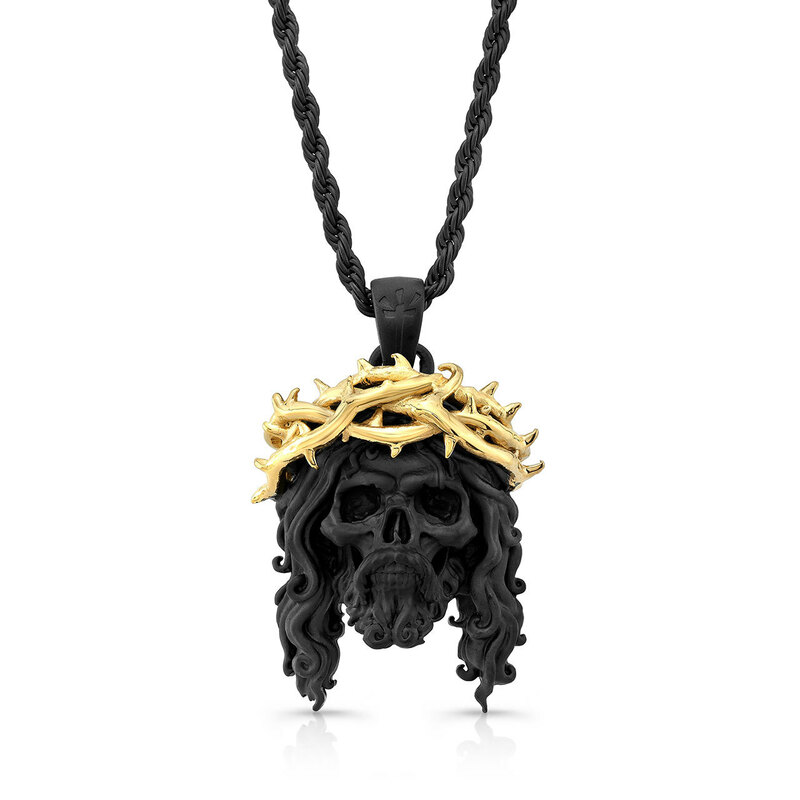 The LTD Chuey Quintanar Matte Black Skull Jesus Piece is available in two versions, limited to just twenty-five pieces each - Stainless steel with matte black finish and Stainless steel with matte black finish and gold vermeil crown. Both come on a 25 inch rope chain. I spoke previously about my initial misgivings on the imagery of the Jesus Skull (and how I'd changed my mind), and eagerly awaited a look at the new design. I also wondered whether or not the appeal would be greater than that of what's currently on the market. This week I found out, and once again my expectation were exceeded. The result is an elaborate and remarkably emotive piece of art brought to life, just as Matt intended. For me this version of Jesus expresses love, passion, suffering, pain and salvation in a way that the 'traditional' versions were unable to. 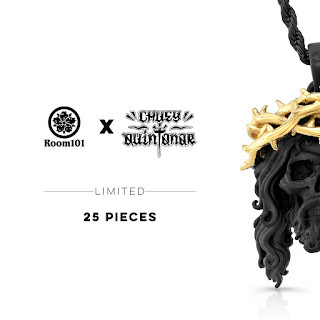 This continues to be the most exciting collaboration series I've seen to date between any artist and jeweller. The complexity of the designs alone show just how gifted and how dedicated both Matt and Chuey are to their respective art forms. I can't see rappers and athletes replacing their gaudy diamond encrusted pieces with these, but for those that are appreciative of art and looking for something more sophisticated this is an essential addition to your collection. You can get yours direct from the outstanding folks at Room101 HERE.